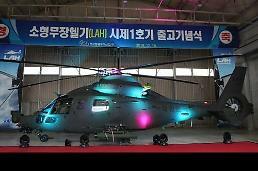 SEOUL -- The deadly crash of a new Marine Corps helicopter this week cast a cloud on South Korea's scandal-stricken state project to produce home-made transport utility helicopters for military and civilian use due to a probe into possible technical defects. 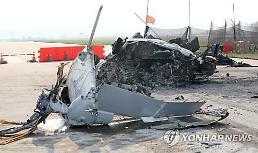 Military authorities, led by the Marine Corps, launched a joint probe to determine if the crash of a Marineon helicopter on Tuesday at a naval air base in the southeastern port city of Pohang was caused by technical faults or human error. The chopper was burned down after falling from a height of about 10 meters. The crash killed five Marines, including its pilot, and left one injured. It has been on a test flight before being assigned to the Marine Corps. The chopper was manned by a veteran pilot with his flight experience standing at 3,300 hours. 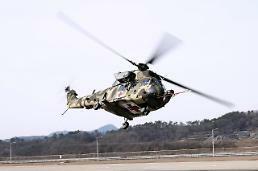 The Marineon helicopter is an amphibious variant of Surion, a twin-engine transport utility helicopter developed by South Korea's sole aircraft manufacturer, Korea Aerospace Industries (KAI), which has a military contract to deliver 28 Marineons by 2023. The army has grounded some 90 Surion helicopters. An unnamed army officer told Yonhap News that the resumption of service would depend on the outcome of a probe into Tuesday's crash. 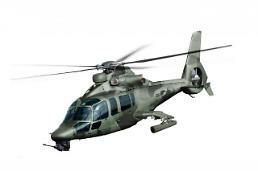 To replace an aging fleet of utility helicopters, the Surion project was launched in 2006 with Airbus Helicopters (formerly Eurocopter) selected as a technical partner in South Korea's biggest arms deal ever with a non-American company. Development was completed in 2012. 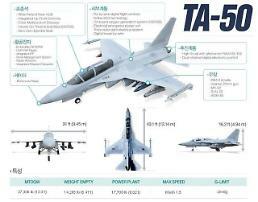 However, state auditors have found the Surion exposed various defects in the field of flight stability, lightning protection and anti-icing capability that caused engine failure and other safety problems, leading to the temporary suspension of delivery. In October last year, prosecutors indicted ten former and incumbent KAI executives for corruption. In June, Surion passed the test of anti-icing capability, but the delivery of Marineon helicopters could face an uncertain future if investigators discover angry grave technical faults from the crashed chopper.